The second part of my trip was spent in Inhambane, starting up our new project there. I have never been to that part of the country before, and I always enjoy seeing new places so was looking forward to it. The goal of the project is to assist the provincial government to implement a water and sanitation project. We will support them and build their capacity, with the intention of enabling them to improve their overall service delivery. The government, as part of the project, is responsible to provide about 125 water points, three small town water systems, and promote hygiene and sanitation with the goal of motivating households to construct latrines. We drove from Maputo to Inhambane. We rented two cars and seven of us drove up from Maputo together – three head office staff, three project staff, and one of our employees from Maputo. 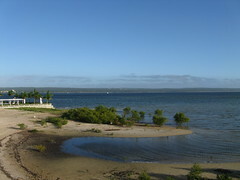 The drive was long and we arrived n Inhambane mid-afternoon. We arrived at the hotel (Casa do Capitao) and were very pleasantly surprised at how nice the hotel was. 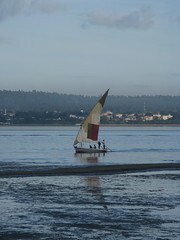 It is located on a little peninsula in the bay. The hotel is brand new and everything was still shiny and white. The rooms were lovely – large with a comfortable bed, great shower and lovely balcony looking out over the water. It really is one of the nicest places I have stayed on or off the job. 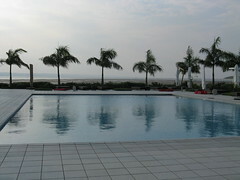 The pool was gorgeous and we sat outside most mornings enjoying the view and eating our breakfast. The food was also really good, although it was expensive. You may have noted that I am going on and on about this accommodations, but usually I don’t stay at very nice hotels! It made the trip so much more enjoyable. The town of Inhambane itself was quite nice. It is a small, sleepy government town. There is only one road to get there and it is at the end of the road so there is no through traffic. If you are there, it’s because you wanted to go there. There were quite a few tourists around as there are some very nice beaches in the area (maybe next time!). It is also one of the cleanest and well maintained small towns I have ever been to in any developing country. I was able to go for several runs in the mornings along the ocean wall, without the fear of stepping in a hole in the sidewalk and twisting an ankle, and the breeze of the ocean was lovely at that time of day. The most annoying thing was that service at most restaurants was unbearably slow. This is the case anywhere, but when you are really busy and have a lot of work to get done, sitting at a restaurant for 2 hours over lunch is difficult. As I mentioned, we were there to start up our new project. The week mostly consisted of meetings and planning for the next 6 months. It was very productive and I think we got off to a good start. I am looking forward to being home soon, but it was actually a little difficult to leave Inhambane – I wouldn’t have minded to stay for another few days and actually relax and enjoy the hotel and explore the town. But I have a flight to catch and some training to get back to … the next trip is on a bike to Kingston and back! All in all it was a very good trip. Submitted by Fernando (not verified) on Mon, 2011-05-23 04:38. Pleased to verify you have apreciated my birthplace!